Excellent for home, classroom, dorm, or office use, this durable and exquisite piece of furniture embodies the need to stay mobile, stay connected and stay hands-free. Adjustable height bar give you versatility when using your tablet, whether you need it while sitting, standing or even at a different orientation. Jointed tablet holder tilts side to side and rotates 360 degrees for landscape and portrait viewing. 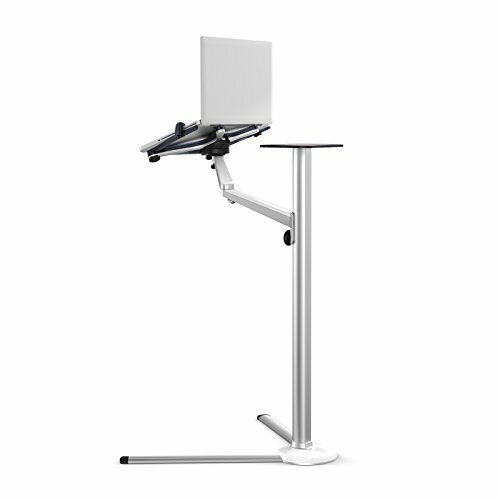 The stand base is made of study aluminum alloy, so it will not easily tip over. Super sturdy construction minimizes annoying bouncing while surfing or typing, and protects your valuable device from tipping over. Free height adjustable from 12" to 42". Swing-arm quickly swings and folds when not in use, or to exit your furniture. 3 pieces of mount holders compatible with all cell phones, tablets and E-readers, 1 piece of laptop tray. Package contents: 1 set of UPERGO floor stand, instruction manual, and free lifetime technical support.